It’s a great season for celery in the Waikato. Last weekend the Suncakes Gardens stall had piles of beautiful fresh unsprayed celery at Hamilton Farmers’ Market. Celery is one of the unsung heroes of the vegetable kingdom. The celery we get in the supermarket all year round is big, pale, crunchy and bland. It doesn’t have any calories, and probably no nutrients as well. And it’s notoriously full of toxic spray residues – celery usually makes the top 10 in the “dirty dozen” lists. So, why should anyone bother with celery? It makes more sense to think of celery as a pot-herb with a nice crunchy stalk, rather than as a vegetable. “Parsley, sage, rosemary, thyme and celery”! 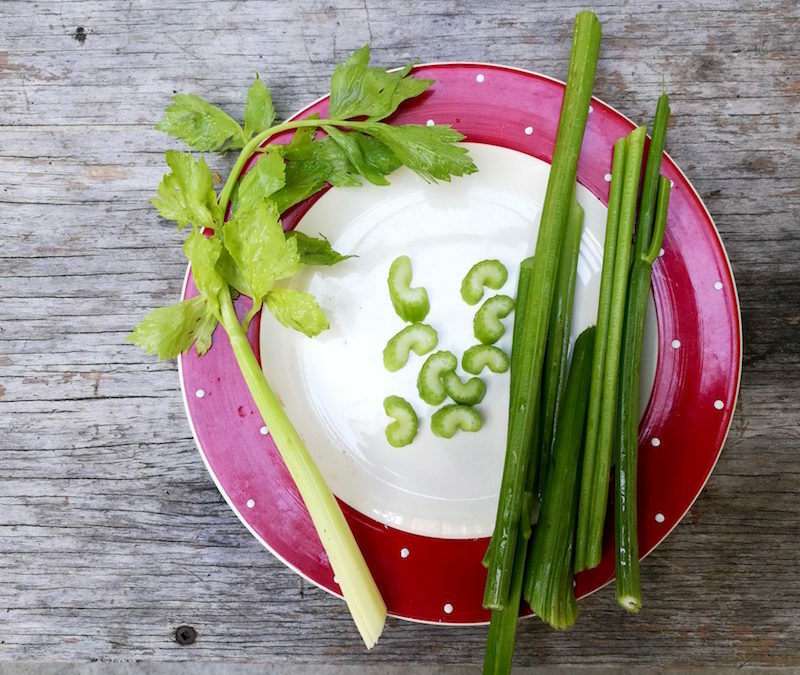 A stalk of celery with the leaves included is the x-factor in just about any bone broth, soup or stew. Celery can be cooked on its own as a vegetable, but it’s much more interesting combined with other flavours. 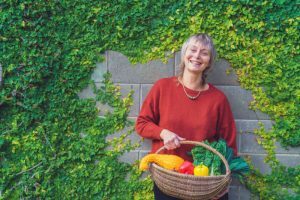 Celery is a member of the Apiaceae or Umbelliferae family, which includes parsley, fennel, chervil, lovage, caraway, cumin, carrots and parsnips. Celeriac, a close relative of celery, is usually eaten as a root. Here’s a link to my post about celeriac. You can use the stalks, leaves and seeds of celery. The leaves can be strongly flavoured so I don’t use more than a few raw. But in soups and soups and stews celery leaves blend well with other flavours. Celery grows most of the year in my garden, but it doesn’t get very big. I grow celery most of the year. This gives me an appreciation for why conventional growers usually end up spraying it. In my garden the celery stalks and leaves often get rust, and the plants don’t usually grow very large. I’m a pretty neglectful gardener and they probably need more TLC than I give them. But they’re still big enough so I have plenty to add to soups and stews and the occasional salad. 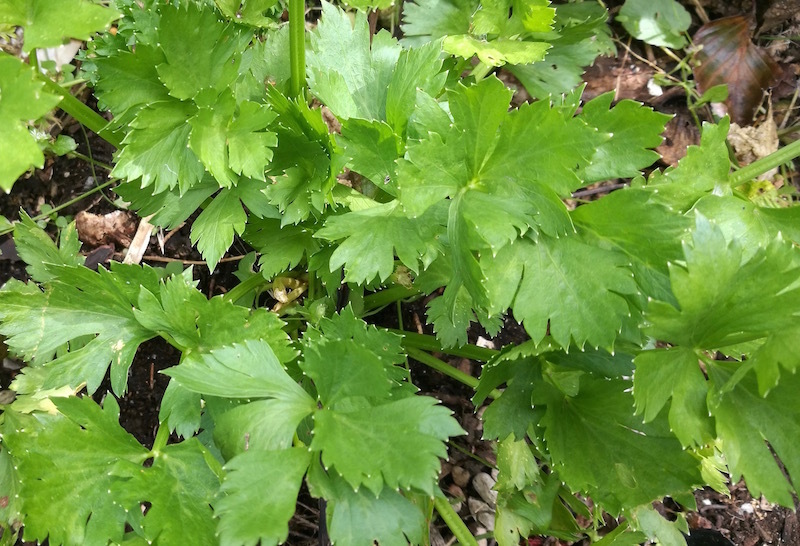 My gardening books say that celery needs compost-enriched soil and plenty of water to thrive. Here’s an easy slow cooker recipe for this time of year. 1 chicken, free-range and preferably organic. This recipe needs a chicken that is substantial and meaty and won’t fall apart after half an hour of cooking. I buy Bostock’s organic chickens. They are infinitely better quality than standard free-range. 1 tart apple, cored and chopped – I used a large Cox’s Orange Pippin from the tree in the backyard. Place everything in a slow cooker. You can cut the chicken into pieces, but I don’t bother. Add more stock if it seems too dry. Turn the slow cooker on high for an hour, then turn to low and leave the casserole to cook for two or three hours. Fifteen minutes before serving, thicken the casserole (optional). Do this by mixing 2 teaspoons cornflour in 1/3 cup of cold water and stir into the casserole. Just before serving, stir in the cream. Replace lid and leave for five minutes. Before serving, fish out the thyme stalks and divide the chicken into portions. Raw celery sticks are delicious with sharp blue cheese. NB if the celery is unsprayed, you can include both finely chopped leaves and stalks in the salad. Taste the leaves – if they’re strongly flavoured then only use a small amount. This interesting salad has celery seeds in the dressing. It comes from Authentic Mexican Cooking, by Susan Vollmer (Nitty Gritty Cookbooks). Combine the vegetables in a large glass or ceramic bowl. In a saucean heat the oil, vinegar, sugar and celery seeds until the mixture boils and the sugar dissolves. Simmer for a few minutes. Pour the hot dressing over the vegetables. Add salt and pepper and stir to combine. Let stand for at least two hours before serving. A classic combo. Celery, apple and walnuts with mayonnaise. Celery, daikon, carrot and spring onion, sliced finely. Toss with a dressing of white wine vinegar and sesame oil with a pinch of sugar and a pinch of salt.